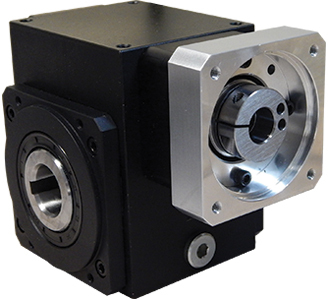 The EJP series is ideal for demanding applications requiring high efficiency, torsional rigidity and zero backlash. It’s lightweight, black anodized aluminum housing and dual input/output seals allow for excellent environmental protection with minimal maintenance. The EJP is part of our modular design platform, which means it can be mounted to any servomotor manufacturer with ease. Our internal design captures both sides of the gear tooth to completely eliminate backlash and guarantee it for the life of the product. Exact reduction ratios allow for simplified servo tuning. 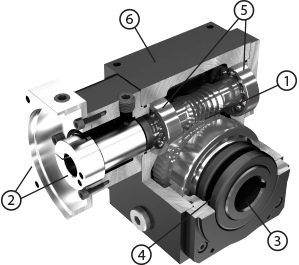 Ratios 5:1 through 60:1 are available in a single stage, resulting in a more compact design. The face mounting option gives customers the ability to directly attach components such as tables, pinion gears and timing belt pulleys, eliminating the need for couplings.